It’s time for Us to have a talk. A pillow talk, that is. It goes without saying that our days are already difficult enough. There really is no need to go ahead and add to that by ending a long day with an even more difficult night of sleep. There is nothing worse! So for those who are similarly struggling, don’t sleep on this! Prepare to meet a pillow so soft, it’s like therapy for our necks. This therapeutic pillow is so soothing it won’t just feel as if we’re floating on water. That’s right, this therapeutic pillow is what dreams are made of. But actually, it’s made with water! See it: Grab the Mediflow Waterbase Pillow for $50, available at Amazon! Please note, prices are accurate at the date of publication, March 21, 2019, but are subject to change. The Mediflow Waterbase Pillow is not just first on our lists, it’s first-class! Mediflow, the brand behind the pillow, has spent more than 20 years on this pillow, making it the most innovative design to date. As the first of its kind, it’s the original option when looking for a water-based pillow that claims to improve sleep. Mediflow’s revolutionary Waterbase technology will support and conform to the head and neck, all while a user sleeps. No, the proof is not just in the pillow. Mediflow noted that a recent study conducted by The Johns Hopkins University School of Medicine clinically tested out the water pillow. After a closer one-on-one study, Mediflow’s waterbased pillow appeared to have proven effectiveness. The study claims to have shown that when opting for this waterbase pillow night-after-night, sleepers found that their quality of sleep improved as well as helped to eliminate their neck pain. Better yet, the study also found this pillow to be the best option to help fall asleep easier and to avoid waking up in the middle of the night! 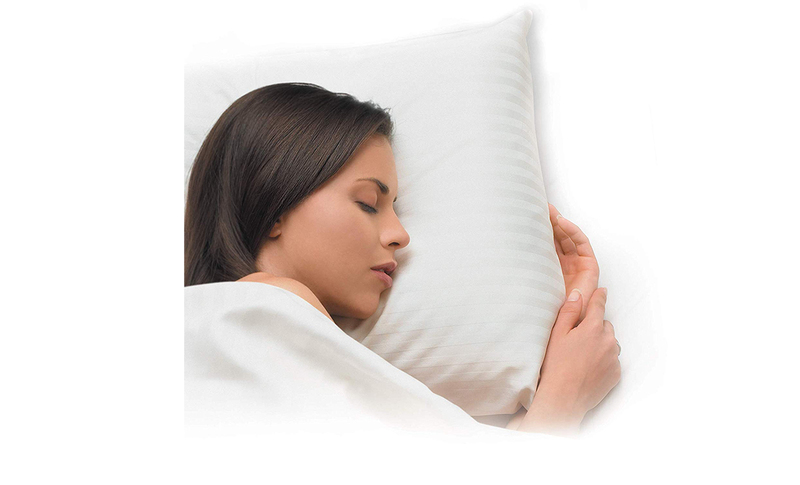 This 100% hypoallergenic cotton pillow was crafted with two layers of love. This totally customizable pillow includes a fully sealed and insulated water pouch that’s resilient. The Dacron Hollofil fiber layer can be found on the top half the pillow. It’s exceptional when looking for some extra comfort. Even more amazing? The bottom half of the pillow, of course! The second half of the pillow includes a 200 thread count cotton shell. It’s ideal for just about all sleep lovers. No matter if a user is sleeping on their side, back or even a stomach sleeper or switch in-between sleeper, this pillow will move with any position. As we said, this pillow is totally customizable and will adjust and fluff with our heads. Personally, that’s music to our ears as there is nothing worse than waking up in the middle of the night to those uncomfortable, unfluffed pillows. It’s like a confirmation that our necks will be stiffer than ever! Thanks to this revolutionary one-of-a-kind model, wave goodbye to those super stiff mornings and say hello to those super soothing nights of sleep! It’s important to note that not only is the proof in the Mediflow’s recent study. It’s also in the nearly 3,500 reviews raving over this revolutionary concept. So many reviewers were nothing short of pleased when it came to this water pillow. There was nothing better than the reviewer who admitted to being a longtime lover of Mediflow already. With over 10 years of consistent support with two other previous purchases, they were excited to test this new-and-improved model out. This reviewer was blown away during the first night of use and claims to have slept like a baby! And let’s be honest, they aren’t alone either. From the user who suffered for years with chronic neck pain to the reviewer who constantly woke up to morning neck pain, this water pillow was the secret to sleep success. Why float on cloud nine when our heads can float away to a bedtime oasis? The supersoft pillow seemed to be nothing but well-received amongst the masses. Our personal favorite aspect of this sleep-saving solution? Its long-lasting abilities. Across the board, so many reviewers were claiming to have had this pillow for years at a time. In fact, the reviewers still experienced results after two years of use that were just as good as their first-time. Talk about not only a sleep-saving solution but a money-saving investment. 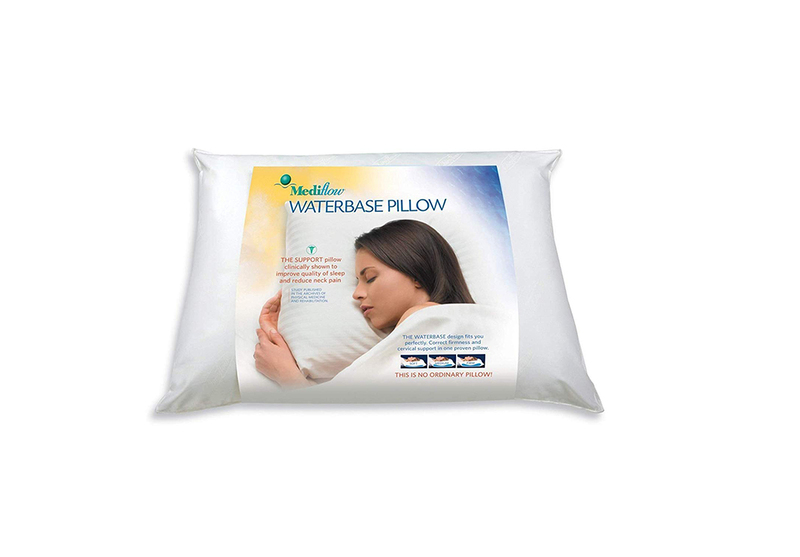 For those looking to solve all of their sleep-related issues, why not go ahead and float away to bedtime oasis in this Mediflow Waterbase Pillow. The good nights of sleep will keep on floating in! Not into it? Check out additional bed pillow options available at Amazon!